INTRODUCING THE ALL NEW HOME COMFORT PACKAGE INTERIOR AIR QUALITY WHOLE HOUSE HUMIDIFIER! The air inside your home is drier than you think! The average home can be up to four times below recommended relative humidity levels. Heating your home dries out the air. 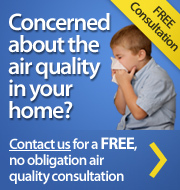 The resulting dry air absorbs moisture from you and everything inside your home. Even new homes will succumb to the negative effects of air that is too dry. Proper humidification offers total comfort and the protection you need to combat the damaging effects of dry, parched air in your home. A whole-home humidifier allows you to feel warmer at lower thermostat settings thereby saving energy. A humidifier can help to keep your home and its furnishings in good condition, maintaining their value and extending their life. Proper humidity helps to keep you healthy in winter by reducing the likelihood of getting colds and the flu. If you're looking for Aprilaire products in Fairfield County, then give us a call today at 914.777.5030 or complete our online request form.